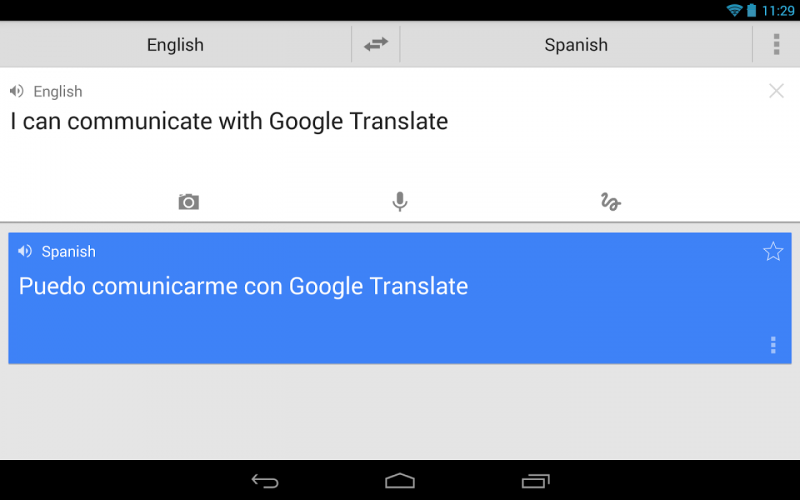 Google is planning to release an updated version of its Translate app for Android offering real-time detection and written translation of popular languages, according to a New York Times report. There is no date set for when the update will be available, though the report notes that it will happen soon. The Translate app, Google says is used by 500 million monthly active users, and offers written translation of 90 languages and spoken translations of a few popular languages. Most Android devices currently running the application are expected to receive the upgrade. The search giant will also soon announce a service that'll let you use your device's camera to automatically translate foreign street signs on screen, according to the report. Without a doubt it's no coincidence this announcement comes only weeks after Microsoft unveiled Skype Translator Preview, which allows real time voice translation between English and Spanish on its preliminary phase. While automated language translation technology could no doubt have some really useful applications, there are, of course, major privacy concerns when it comes to collecting user data. “What would it mean to have a corpus of conversations after there is regime change, and a new government doesn’t like what you said?” said Kelly Fitzsimmons, co-founder of the Hypervoice Consortium, which researches the future of communication.